An extensive collection of recent work by a poet who ranges widely in themes and techniques, The Hope of the Air offers a cornucopia of heart-felt insight, meditation, and celebration as it evokes a life on the contemporary scene observed with humor, perception, and brilliant invention. Spacks’ latest work is concerned with the crystallization of emotion in words, with new angles of vantage that allow feelings to shimmer and deepen as the record of immediate experience lilts and takes unexpected turns on the Dickinsonian "slant" toward larger meanings. 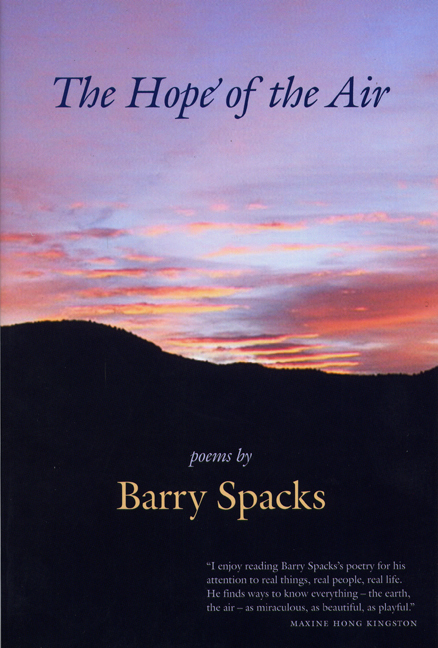 Barry packs is a Prize-winning poet, novelist, librettist, singer- songwriter, actor, and lifelong freelance editor who has been named Poet Laureate of the City of Santa Barbara. He taught writing and literature at MIT from 1960 to 1981 and continues teaching in the English Department and the College of Creative Studies at University of California, Santa Barbara. Spacks has held Fulbright and NEA grants and was a recipient of The St. BotolphÆs Arts Award.